Haven’t decided on a hotel yet? 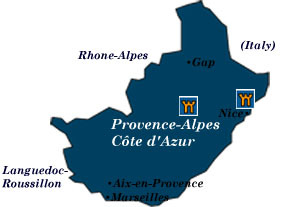 You can look at other available hotels in Provence-Alpes-Côte d’Azur region with Booking.com. If you are interested in staying in a villa in Provence-Alpes-Côte d’Azur, Booking.com offers a number of stunning properties. A brilliant landscape of snowcapped, jagged peaks peering down onto orchard-dotted valleys and rushing rivers, gnarled olive trees, and fields of lavender and sunflowers—all bathed in a luminous light—have seduced artists, writers, and expatriates for centuries. Joyous and vibrant, Provence offers the stars that sweep in a canopy above van Gogh’s landscapes, as well as the stars that glitter in the galaxy of the ever fashionable towns of the Riviera. You can attend a concert among noble Roman ruins, stroll through precious medieval hilltop villages, wander the docks of a noisy fish market in Marseilles, or bask in the glorious warmth at an outdoor café, enjoying a Rhône wine and le cuisine du soleil—the cuisine of the sun. Avignon Capital of Christendom in the 14th century, nine popes left a legacy of one of Europe’s most famous fortified palaces—the Palais des Papes. Once filled to the brim with priceless treasures, a walk through will set your imagination ablaze with images of the extravagant court that once attracted the world’s diplomats, thinkers, and artists. Jumping forward to the 21st century, the Festival d’Avignon, held every July, presents renowned theatre productions throughout the city, and an alternative festival with performance artists of every conceivable genre spills out into the streets with fun for all. Roman ruins Provence has superb Roman ruins. Begin in the city of Arles and the state-of-the-art Musée de l’Arles Antique. Continue on to the Arènes, the ancient Roman arena. Built in the 1st century, some 20,000 people attend bullfights here in the summer. In the city of Orange, the Thèâtre Antique, an enormous, 4-story, Roman theatre built in the time of Augustus, boasts clear acoustics and hosts world-class theatre, concerts, and dance performances. The French Riviera With glamour to spare, multi-million-euro estates overlook harbors lined with yachts larger than most people’s houses. Take your pick of dazzling towns—St. Tropez, Cannes, Antibes, Juan-les-Pins, and Cagnes sur Mer—and play the fantasy. Pay for your extravagances by hitting that big one in the Casino of Monte Carlo. Come down to earth in Nice and stroll the famed Promenade des Anglais before catching that train or plane for home. Les Baux Spectacularly set on a promontory of sheer rock ravines, the medieval fortress of Les Baux is one of France’s most visited sites. Now an eerie, moonlike ruin, 6000 people once resided here. Home to the powerful and warlike feudal lords of Les Baux—said to have descended from Balthazar, the court attracted knights and troubadours who upheld the virtues of chivalry. Gorges du Verdon Considered the Grand Canyon of Europe, limestone cliffs soar 700 m (2300 ft) into the air. Blessedly, the traffic on the winding roads leading to the canyon is light. Outdoor activities—including hiking, climbing, horseback riding, and rafting—is readily available. Uzès, near the Pont du Gard, it boasts medieval towers and an arcaded marketplace. Gordes, dominated by a 16th-century castle, this “perched” village is crossed by medieval lanes. Rousillon, in the Luberon, is famed for its red-ocher buildings. Roquebrune is one of the most unspoiled villages along the Riviera; its 10th-century castle looking down on the village is one of France’s oldest. Peillon, scarcely changed since the Middle Ages, is another special “perched” village in the back hills of the Côte d’Azur. The lavender fields If you drive along the “lavender routes” in mid-summer—when vast fields burst into bloom—you’ll never forget the pungent scent that permeates the air. In Coustellet, le Musée de la Lavande celebrates the lavender flower. Marseilles Ships have docked at Le Vieux Port, or the Old Port, for 2600 years. Two sturdy, 17th-century fortresses guard the entrance to Marseilles’s economic center. Pleasure craft now fill the harbor instead of trading vessels bringing in exotic goods, and the nearby lively fish market gives insight into real lives. In the distance you can spot the Château d’If, immortalized in Alexandre Dumas’s Count of Monte Cristo. The Camargue The Rhône Delta has created a fragile ecosystem of wetlands, dunes, and salt flats, home to egrets ibises, flamingoes, longhorned bulls, and those famous sturdy little white horses. The art museums Fellow in the footsteps of your favorite artist. The colors and light of Provence was a natural draw to some of the world’s greatest artists. Art museums devoted to their finest works are well worth a detour. Choose from Chagall, Matisse, Picasso, van Gogh, Fernan-Léger, and Renoir.